Thought I would stray from my normal oatmeal flavored with maple syrup breakfast that I have EVERY morning rain or shine. So I made some biscuits to have with fresh strawberry jam and they were delish! Here's my never fail, flakey biscuit recipe. Notice that the rounds are stacked one atop another. O Yum! A dollop of real butter, with fresh strawberry jam! And add a cuppa with frothy skim milk topped with finely grated chocolate. A treat from my normal everyday breakfast...even tho' I luv my oatmeal! Did some crochet this last weekend as well. I made these mandala flowers, inspired by some of my favorite bloggers (see those listed on my side bar). I am still enamored by the mandala and did a small blog on the subject awhile back. There is something very satisfying for me doing a colorful mandala...just going with the flow and choosing the colors that appeal to me at the moment. 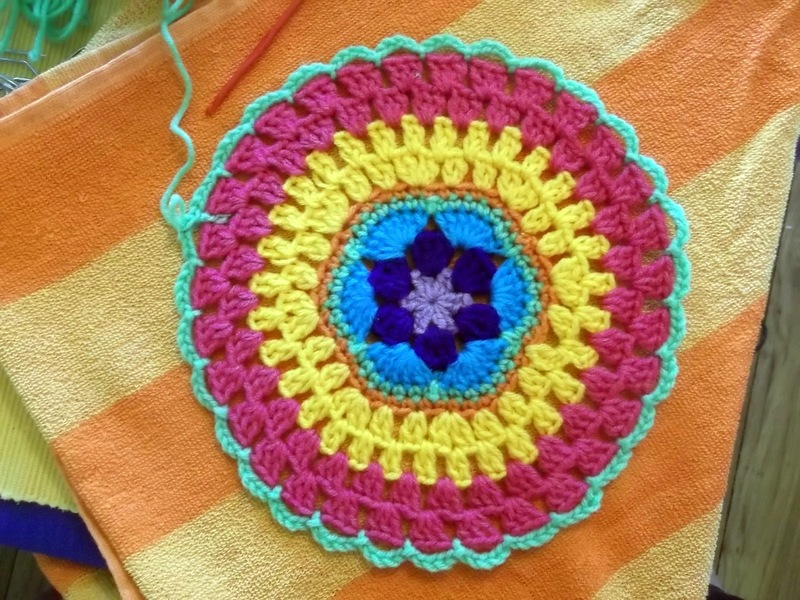 No planning, just color and crochet. :) And the colorful leaves are a bit of fun as well. And added a few buttons to the centers for a little dimension. I took these pictures outdoors on my patio table...these are kissed by the sun's brightness! This one I did up last night, but not sure what it will become as yet or how big it will get. Well, that was my weekend. Nothing too exciting or earth-shattering...just some quiet summertime moments. The sun is bright, skies are blue and 'summertime' is in full swing. We are fortunate here on Vancouver Island, BC Canada in that the sea breezes cool off the evenings quite nicely. I love the smell of summer...that mixture of everything warmed by the sun, the salty sea, and the fragrance of summer blooms. LUV IT!!! Biscuits look delish! You have inspired me to get back at my crochet. Thx. Very cute.